Involtini is an Italian word for a small bite of food consisting of some sort of outer layer wrapped around a filling. Involtini can be made with meat, poultry, seafood or vegetables and with fillings like pasta, cheese, vegetables, cured meats and nuts. This particular recipe is for the traditional involtini served in Palermo (“alla Palermitana”) and sees the Arab influence on Sicily with the use of sultanas and pine nuts in the filling. 1. Place the sultanas in a small dish of water to rehydrate for about 10 minutes. Drain well. 2. Quickly fry the finely chopped onion in about 2-3 tablespoons of olive oil, until soft. 3. In a small bowl, add the grated cheese, breadcrumbs, pine nuts, sultanas and fried onion. Add the remaining oil and mix well. Season to taste. The mixture should be quite lumpy and not compacted. 4. Flatten and soften the meat with a tenderiser or back of a knife. 5. Brush one side of the fillet with olive oil and add some of the stuffing, making sure to not overstuff. 6. Roll using the short end until a small involtino is formed. Slice in half to form two small involtini rolls. 7. Split the quartered onion into smaller sections, so that you have about 24 sections to add to your skewers. 8. With a skewer add one lemon leaf (doubled in half if they are large), an onion section, an involtino and repeat until the skewer is filled. Finish the skewer with either a lemon leaf or onion to secure the end. Repeat the process for all skewers. 9. Place some breadcrumbs in a plate large enough to place the skewers. 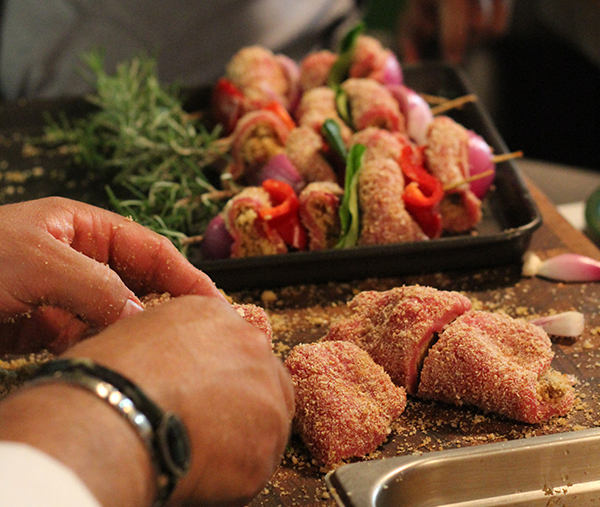 Brush the involtini with some olive oil and dip in the breadcrumbs. Place the skewers on a hot grill or oven for about 2 minutes per side, or until the meat is cooked. 10. Serve with a wedge of lemon and a side dish of choice. – If using bamboo skewers, make sure to soak them in water first. – The use of lemon leaves is optional and for added flavour. A similar effect can be obtained with any citrus or bay leaf if available.